Hanoi is a city in which first impressions can be totally inaccurate… especially if you’ve just come from South Vietnam. 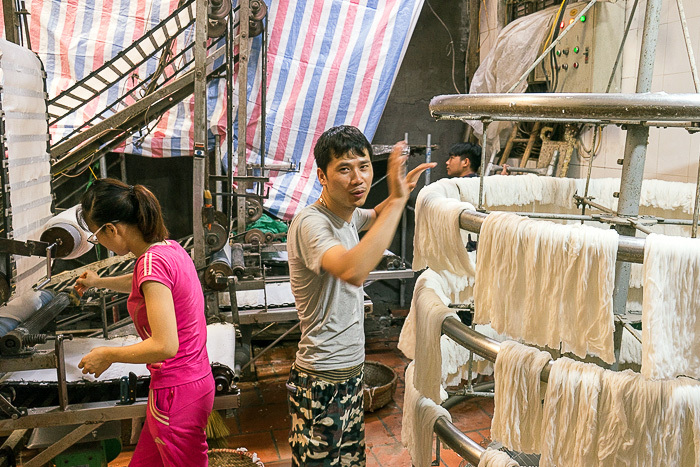 The relaxed and friendly demeanor of Saigon is nowhere to be found here, and the initial feeling we had wasn’t positive. 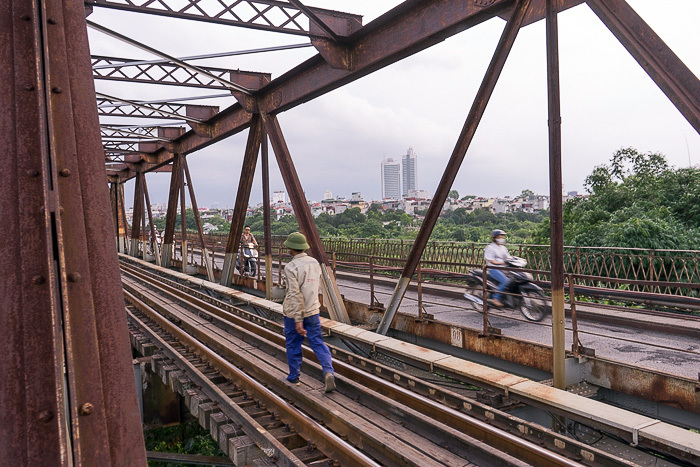 But after a month, we started to understand the city on its own terms, and not just in comparison to Saigon. Mike: Visiting Ho Chi Minh’s Mausoleum was one of those surreal moments which make travelling such fun. The line is almost all Vietnamese tourists who’ve come to respect their country’s greatest hero, and it was interesting to be among them. And I’ll never forget that creepy, waxy corpse! Jürgen: The moment in which my opinions about Hanoi began to change for the better, was when we visited the forging village of Đa Sỹ. We hadn’t been expecting much, but had such a wonderful day there. It’s one of my favorite memories from Hanoi. Mike: We’ve been spoiled by Vietnamese cuisine for five months, but the dish that Hanoi does better than any other is the classic: Phở. We’ve had some amazing bowls here… just don’t ask me to pronounce the word. Jürgen: My favorite dish in Hanoi must be Phở Cuốn, the Phở version where the main ingredients are not floating in soup but rolled up in a rice flour crepe. A serving of ten is nothing for me! Oh, and I loved my daily coconut coffee. Mike: I knew that dog was on the menu in North Vietnam. But I hadn’t expected to see roast dogs being sold at a stand directly across from our downtown hotel. This was a serious shock, and one I had a hard time getting over. Jürgen: The actual size of Hanoi is stunning. If you’re only staying in Hanoi’s Old Quarter you’d think that Hanoi is just a small little town. Go up to the viewing platforms of the Lotte Center or the Landmark 72, and let the city’s true size sink in. Mike: The Old Quarter of Hanoi was really disappointing since we’d heard so many wonderful things about it. But we hated (almost) everything about this section of town… the party-bro backpackers, the price-gouging, the thirty-four restaurants named “Gecko”, the endless touts hawking Sapa tours. Awful. 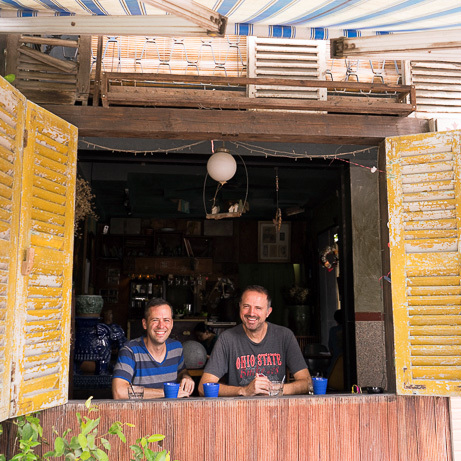 Jürgen: I was probably mostly disappointed in myself, because I allowed my opinions of Hanoi to be influenced by its most negative aspects, such as the pushy cyclo drivers and the restaurant owners who overcharged us. Mike: I wouldn’t necessarily call it “funny” but our evening of Ca Tru was definitely one of the weirdest cultural experiences we’ve had. Such strange music, I can’t imagine that anyone really enjoys it. Halfway through the show, as the drummer struck another of his ridiculously arrhythmic beats, I started to suspect that the entire show was a joke… maybe these were just Hanoi hipsters who enjoyed pranking foreigners! Jürgen: We sat down in a restaurant for lunch and had just enough cash, so I asked the owner of the restaurant how much it was going to cost. But she saw us counting our money, and thought we must be very poor. After we were done eating, she refused to accept any money. We felt horrible, but didn’t want to protest too much! Mike: 2. Like anywhere, it’s possible to spend a lot of money, but this is still Vietnam. If you eat like a local, it’s extremely cheap. The various museums and sights cost next to nothing. Jürgen: It really depends where you are in Hanoi and how you eat. For locals, it’s a 2, but for the average tourist that number goes up. Mike: a little colder than their brothers in the south, for sure, and less open to the world. But individually, we encountered people to be just as kind and helpful. Jürgen: surprisingly generous. They remind me a bit of Germans; at first they can come off rather unfriendly and rough around the edges, but warm up once you get to know them (or they get to you know you).